I am so excited about our latest product - Genuine Wasabi Powder! Now you can get the clean, spicy, fresh flavor of genuine wasabi in a convenient powder. Most “wasabi powder” is a blend of mustard, horseradish, and dyes, our powder is made from 100% genuine wasabi - no fillers! Mix our Wasabi Powder with water to make a paste. Cover and let it rest for 10 minutes to allow it to develop its full flavor. The resulting wasabi paste is perfect for sushi or mixing into dipping sauces, salad dressings, or mayonnaise. Posted on March 8, 2019 by Jennifer Bloeser. 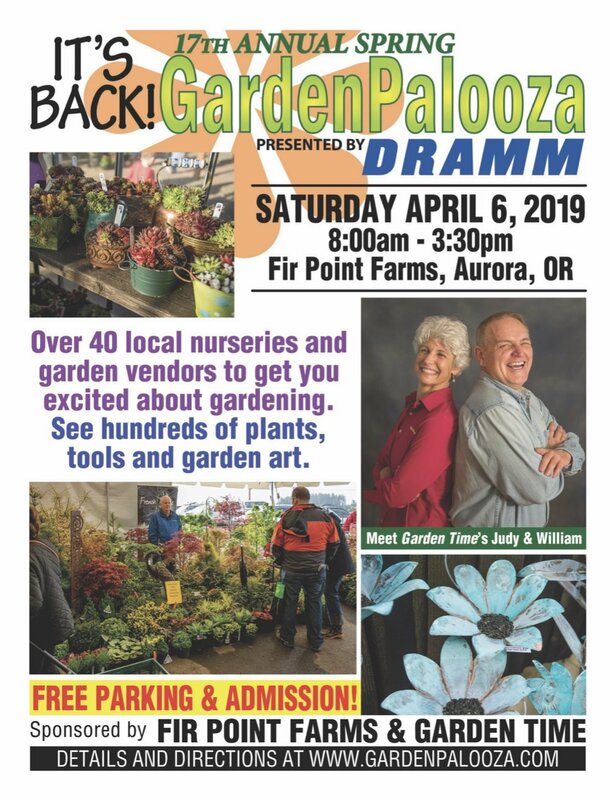 We will be attending 6 different plant sale events here in the Portland, Oregon metro area this spring. Please see below for the list of events. At each of these plant sale events we will have Wasabi Plant Starts with us for you to purchase so you can grow wasabi in your backyard! We look forward to seeing this spring! Posted on March 4, 2019 by Jennifer Bloeser. Pre-Order Your Wasabi Plants Starts! Believe it or not, soon winter will lose it’s icy grip and spring will be here! You can now pre-order your wasabi plant starts! Place your order now, and your order will be sent to you the week of April 1st! I wanted to say a BIG thank you to everyone who participated in our wasabi salt giveaway! We received lots of wonderful creative uses for our wasabi salt and we will soon be posting an article listing all of them! Lastly – I wanted to let you in on a secret… We have brand new wasabi product. We will be announcing this item very soon. If you poke around our store you might just find it. Posted on February 15, 2019 by Jennifer Bloeser. How have the wasabi plant starts been doing in the garden after planting in mid-November? This 2-minute video compares the two barrels, one with plants in potting soil only and the other amended with pumice. Happy Holidays. Posted on December 16, 2018 by Oregon Coast Wasabi. We know that many of you want to give the Gift of Wasabi this holiday season and we have a discount code for you so you can save 10%. Use code XMAS2018 when you check out and save 10% on everything you order! Our 2018 Holiday 10% discount code XMAS2018 will be in effect until Dec 31st. Please place your order by Midnight Pacific Standard Time Saturday December 15th to receive your order by Christmas. 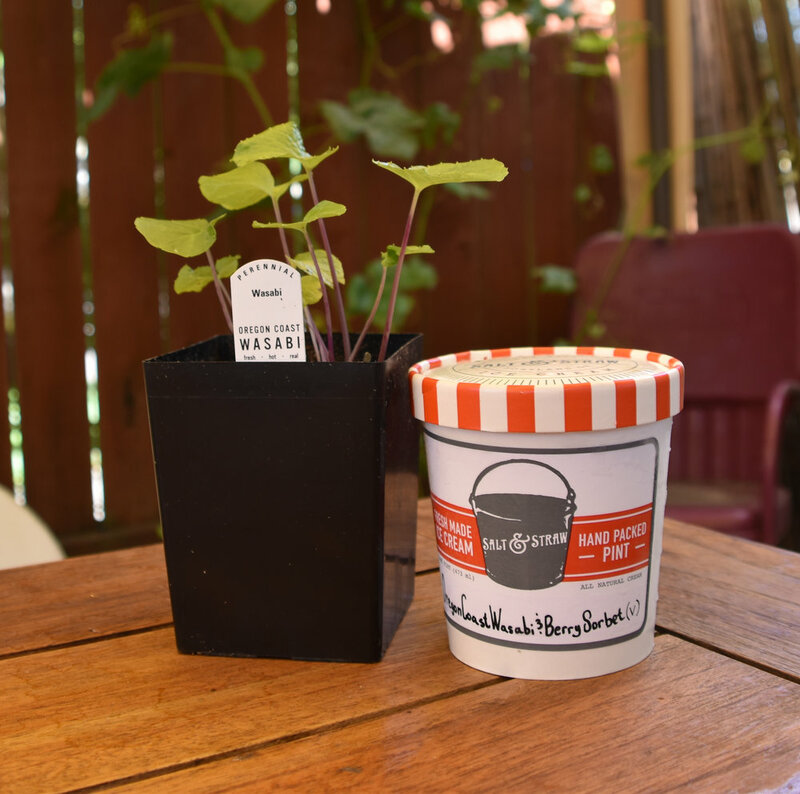 We have a five different gift packs – 3 Wasabi Salt gift packs, a Garden gift pack, a Culinary gift pack, and two different gift certificates – both Garden & Culinary available for you! Please Note – the Holiday 10% discount code XMAS2018 applies to every item in our store! Marcus and I wish you a Merry Christmas and a Happy New Year! Posted on December 4, 2018 by Jennifer Bloeser. This video re-plants two existing wine barrels with wasabi plant starts (seedlings). We use the recommended media which is standard potting soil and whatever nutrient amendment you have available. In our experiment, one barrel is amended with 1/2-inch pumice for added drainage. We will have photo updates of the plants in months to come. Thank you for watching! ~Markus Mead, Co-Founder and Farmer, Oregon Coast Wasabi. Barrel A: No pumice. Showing the potting soil and nutrients only. Barrel B: Pumice and nutrients. 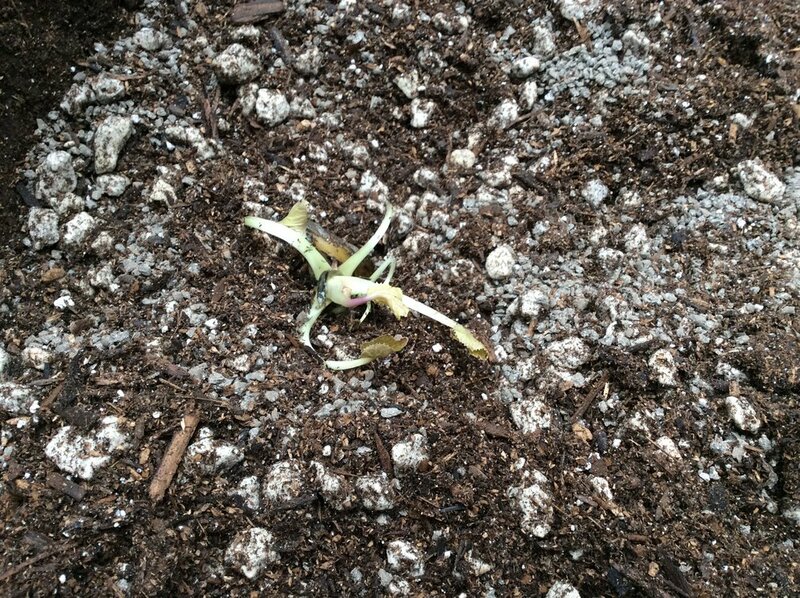 Showing planted with the wasabi plant starts; bare root. Barrel B: closeup of a planted wasabi plantlet. Barrel A: No pumice showing planted with plant starts. Posted on November 25, 2018 by Oregon Coast Wasabi. New Video by Markus Mead the Wasabi Ambassador About Our Brand New All-Purpose Wasabi Seasoning Salt! 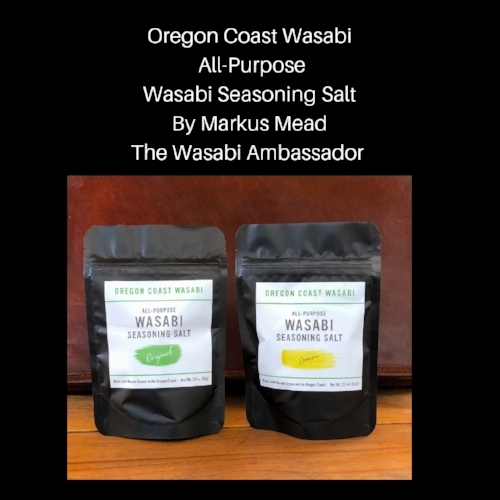 Check out this video about our brand new All-Purpose Wasabi Seasoning Salt by Markus Mead the Wasabi Ambassador! Posted on November 8, 2018 by Jennifer Bloeser. Introducing Our All-Purpose Wasabi Seasoning Salt! We are thrilled to announce that we now have All-Purpose Wasabi Seasoning Salt! We are offering two flavors – Original and Lemon. Our All-Purpose Wasabi Seasoning Salt is now available for you to purchase. Any orders placed by Saturday November 3rd will ship by Monday November 5th and you will have your Wasabi Seasoning Salt in time for Thanksgiving! Please use the Discount Code - “SEASONINGSALT” at check out. This will save you the equivalent of 30% off shipping. Please Note – this is our first batch and we have a limited supply on hand. Once this batch is sold out we will not have any more until December. Our All-Purpose Wasabi Seasoning Salt has many uses! We love it sprinkled on salad, popcorn, eggs, mashed potatoes, steak, chicken, fish and more! You can also as a dry rub for meat, and as a rim salt for cocktails! This is a premium wasabi salt made with Kosher salt, and Oregon-grown freeze-dried wasabi and lemon peel. We are bringing the zest and joy of wasabi flavor to your favorite dishes! Posted on October 30, 2018 by Jennifer Bloeser. One of the questions that we get asked is - Can Wasabi be planted in the fall? The answer is “Yes!” you can plant wasabi in the fall! In much the country during the fall the temperatures will be between 80 degrees and 32 degrees – temperatures between which wasabi does very well! Posted on August 20, 2018 by Jennifer Bloeser. Salt & Straw’s Raspberry Wasabi Sorbet Made With Oregon Coast Wasabi! We are thrilled to announce that Salt & Straw has made a wonderful Raspberry Wasabi Sorbet and this sorbet is made with Oregon Coast Wasabi! This sorbet is one of Salt & Straw’s July seasonals and it will be available at their Portland area stores. 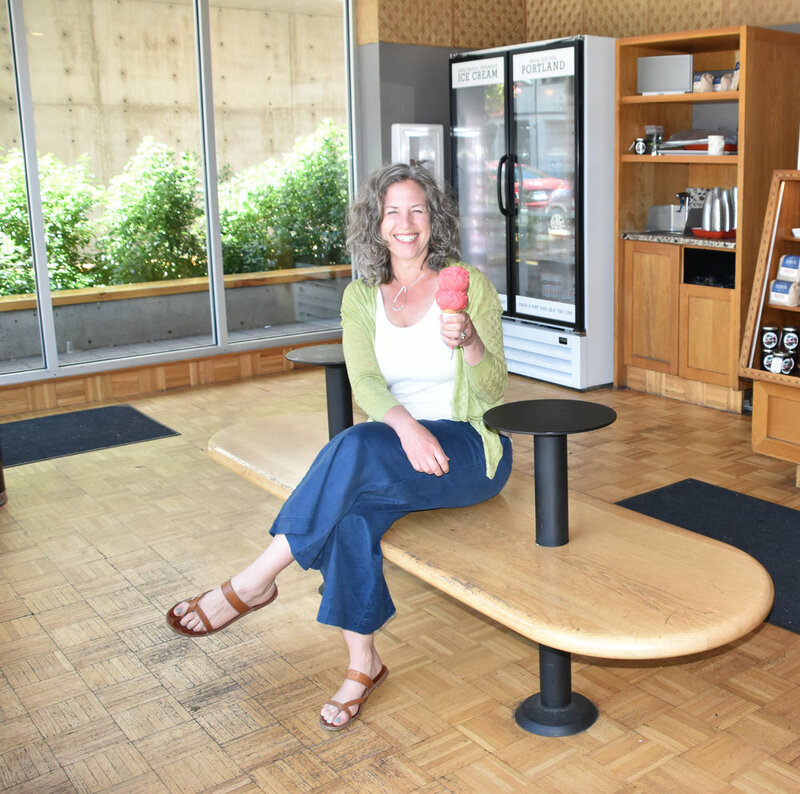 The Raspberry Wasabi sorbet debuted yesterday - Friday June 29th, and Oregon Coast Wasabi CEO and Co-founder Jennifer Bloeser went to her local Salt & Straw and she loved this sorbet as did Pirro the wasabi farm dog! Many thanks to Cynthia Ryan for the photo she took during Jennifer and Pirro's visit to Salt & Straw! Posted on June 30, 2018 by Jennifer Bloeser. For those of you growing wasabi in your backyard we have put together this handy FAQ document. Shade or sun? Full shade. All year. Filtered sunlight is OK. When to plant? Wasabi can be planted any time of year. It's not limited to spring planting. We favor spring or autumn planting which assures a wet winter establishment period and ready in time for tender April leaves and leaf stems for wasabi zuke. What about transplant shock? Wasabi is quite resistant to this shock. The plants can be pulled out of the ground, the offshoots removed and everything replanted at any time. If, after reading these FAQs, believe you could improve your plants' conditions, feel free to remove them from the ground, put them back in the refrigerator for up to 2 weeks in a plastic bag with a damp paper towel inside, refine the growing conditions or location and replant. The plants are bare root, how soon should they be planted? They can remain in the shipping bag for up to 3 weeks with no problem. Open the plastic bag to allow the plants to breathe and insert a damp paper towel. Plant them when the temperatures are lower and/or there is rain forecasted. It's better to wait to plant them when conditions are better than try to plant them in a hot or dry period. Singular or grouped? You can purchase one plant, however Wasabi plants in a group form a leaf canopy that retains soil moisture and shades the central stalk. Plant them approximately 8 inches on center. The more plants there are the more successful they seem to be. Is it cold tolerant? Yes. The garden plants at our home in Portland, Oregon experience lower temperatures than the farm plants at the Coast. Winter of 2016/2017 experienced multiple days below freezing and consecutive nights in the upper teens (see link here). 95% of the garden plants survived. The summer of 2017 was hot and dry and we realized more plant loss than in the winter. It seems that Wasabi has more cold tolerance than heat and dry tolerance. Stated differently, summertime is more of a danger than winter (this is of course a generality). We recommend keeping more of the leaf canopy in height of the summer to provide shade to the central stalk. Does it spread? No. Not like horseradish or mint or strawberries. Wasabi propagates via offshoots that grow from the base of the plant. The offshoots don’t grow offshoots while it’s attached to the main plant/stalk. You can control the area of wasabi by pulling off the offshoots and replanting them in the area you want them to occupy. When can the offshoots be removed? They can be removed and separated at any time of year although spring and fall seem to be the best times. Plant the offshoots about 8 inches apart. This allows the plants to form a leaf canopy. How long do they live? At least up to 10 years. Most of our garden plants are 3-4 years old. When is it harvested? Leaves and leaf stems are harvested at any time. Whenever the plants have enough leaves and stalks for whatever you want to do with them. The central stalk (rhizome) that is grated into paste will likely take two years to grow into the size you would want for a meal of 4-6 people. The leaves and leaf stems can be harvested about every 6-8 weeks (this is how long it will take the leaves to grow back) without negatively impacting the growth of the plant. The plant is a brassica and like kale, brussels sprouts etc. the leaves can be removed while this central stalk grows. Planting Depth: Plant them only as deep as it takes to keep them upright. About 1/2 inch. If you are repotting your plant don’t plant them any deeper than they were in the original pot. Don't compact the soil to remove oxygen from the root zone. Wasabi prefers an oxygenated environment at the root zone. Keep the growing medium light and fluffy. Don't compress the planting area after planting. What to plant in: We recommend a good potting soil. If your soil contains clay, amend with the following: coconut fiber, pumice, or gravel. Optimal is potting soil, coconut fiber and pumice at a 1:1:1 ratio. Wasabi prefers an oxygenated environment at the root zone. Keep the growing medium light and fluffy. Don't compress the planting area after planting. Can they be planted inside? Yes, but don’t put it on the windowsill remember this is a shade plant. Bathrooms are good. Dark corners with no direct light are good. See "what to plant in" in this FAQ. Can they be planted in a stream? Yes. Though wasabi is happy on the stream banks and even slightly up the bank. It may not grow in the stream channel if the channel is too deep, it is not an aquatic plant. So, plant it on the sides of the stream with water moving through the soil. How long before I can harvest: The central stalk (rhizome/ not root) is what is grated into a paste. It will take about two years in a garden to grow a good sized rhizome. But the leaves and leaf stems (as opposed to the central stalk) can be harvested about 15 times while the stalk grows. We recommend to harvest the leaves and leaf stems at most every 6 -8 weeks depending on how fast your plants are growing. We also recommend to harvest fewer leaves and leaf stems in the summer to allow a canopy to form which shades the central stalk and helps prevent it from drying out and retaining soil moisture. Can the central stalk be cut to make paste and the plant still grow? No. The plant won’t regrow. The plant needs both the roots and the top of the rhizome to grow. Cutting off the top and replanting the top won’t work either: we tried. Additionally, cutting off the bottom to retrieve the stalk won’t work either. This doesn't work with carrots, and neither with wasabi. Enjoy the leaves and leaf stems while the stalk grows. Enjoy the flowers and the year-round greenery. What's the best soil type and pH? Slightly acidic soil. Wasabi prefers acidic soil to as low as to 5.8pH. Planting under fir trees is ok but the tree roots can compact the soil, preventing the wasabi roots from growing and retarding canopy (leaf and leaf stem) growth. If you plant under fir trees, make a raised bed or dig out an enlarged area and replace the soil with the optimal amended type described in "What to plant in". Why do the plants arrive bare root and not in pots? Shipping the plants bare root is easier on the plant and reduces the shipping weight. Does it flower? Yes. The plants begin flowering about late January or early February and will flower until early to mid-May. The flowers are edible and can be tempura-fried or steeped into a tea or raw in a salad or cooked into soup. Does it get bitter? No. The flavor doesn't change during the flowering cycle. Does it bolt? No. Wasabi is a perennial plant that produces leaves year-round, it does not bolt and die off. The plant parts are edible and delicious through the flowering cycle. Each central stalk / rhizome will have undergone multiple flowering cycles before harvest. Are there any pests? Wasabi is susceptible to some fungal pathogens. Also, aphids and slugs are animal pests. Wasabi grows like a banana plant and the leaves naturally die off over time if they aren’t harvested. Slugs seem to prefer the dying leaves. Leave these on for the slugs to eat and they’ll leave the center leaves alone; for the most part. If you have pest issues, you can use Safer Soap for aphids and a water/bleach solution for any fungal pathogens. Put 3-4 tablespoons of bleach in a gallon of water and soak the plants for 20 minutes. Rinse them in clean water and replant in fresh soil. You can trim off the leaves and leaf stems if they are pulling the plant over after replanting. Does it have to grow in running water. No. Wasabi is not an aquatic plant. Wasabi does just fine in soil with the right conditions. Reference "Can they be planted in a stream". How big do they get? Height: approximately 2-3 feet. Canopy: approximately 1.5 feet diameter. Stalk: range from 0.5 inches to 2 inches diameter. Leaves: up to 6 inches in diameter. Leaf stems: up to 1.5 feet in length. Do they die back? No. But they do grow more slowly in the heat of the summer and during any frost. Are they going to take over my yard or stream. No. Reference Would they be invasive in a stream? Are they pet friendly? We've had one report that pet rabbits like eating the plant. The rabbit was perfectly healthy. We have also heard from people who have had their chickens and goats eat the plants. They are a bit spicy for deer. We know of no known negative reaction with any animal. Can I grow them in pots. Yes. Reference Can they be planted inside? How big of a pot? 1-2 gallon sized pot for a single plant. 5-gallon for three plants or larger for more. Reference When can the offshoots be removed? What parts are edible: The entire plant including the central stalk (rhizome), leaves, leaf stems, flowers and roots. Should I peel the stalk before grating? No. We offer a brush to remove any dirt, or excess vegetal matter. How to eat the leaves or leaf stems? Generally, raw, steamed, sautéed or juiced. See our recipe page for more ideas. How to divide the plant and offshoots. Pull the entire plant out of the ground. Wash off the roots in water either with a hose or soak in a water bucket. The plant is quite physically robust, this won't harm the plant. Gently pull the offshoots and associated roots away from the main plant. Replant to appropriate depth and spacing. How much water in the summer? As much as one would water lettuce. Assure no direct sunlight for any amount of time in summer. Yellow leaves on the side. With green leaves in center. This is natural. The leaves naturally die away. Top/central leaves are yellow. Unhappy. Amend soil with "optimal" ratio or the soil is holding too much water. Grow slow. Too dry, too wet, too hot or too cold. Light red stems: when young this is typical. Dark red stems : The plant is unhappy. Likely too much water at the roots. Amend the soil and relocate to another shady spot. Posted on June 21, 2018 by Jennifer Bloeser. “Harvesting”, “picking” the heart-shaped leaves and wasabi stalks from the garden wasabi that was last “harvested” on December 6(?) approximately 2017. The video shows the harvesting and leaf growth and some fertilizing. The photos then show the steps of how I prepared the heart-shaped leaves and wasabi stalks for a slow ferment (identical to sauerkraut process), as opposed to a quick ferment wasabi zuke-sytle. In another two weeks in a successive article, I’ll remove the vegetable (stalks and leaves) from the ferment and report on the taste. Thank you for your interest in our produce. Step 1 (not shown) Wash the wasabi very well in a colander. I recommend washing the leaves multiple times. Slugs can leave "waste" on the underside which shouldn't be fermented. Step 3: cut leaves to desired size. This is my preferred size. The leaves will shrink naturally during fermentation from losing water. Step 4: cut stalks into desired length. Mine are uneven, but 1/4 inch to 1 inch and includes flowers. Step 4: place salt in the bowl and mascerate to release water (standard sauerkraut process). Place in a fermentation vessel and wait for your desired length of timm. Then, remove and eat! Posted on March 25, 2018 by Oregon Coast Wasabi. Markus Mead, Co-Founder and Farmer of Oregon Coast Wasabi. Jennifer’s husband and business partner. This video shows the garden wasabi plants following several below-freezing nights and about one inch of snow in late February. The video was filmed on Sunday Feb. 25 and the low on Friday Feb. 23 was 21 degrees fahrenheit and snowing. Only one leaf indicated a slight bit of cold damage evidenced by a bruising. Though, the majority of the heart-shaped leaves and leaf stalks and flowers were undamaged by the frost. Next video will harvest these leaves and leaf stems and ferment them in the same method as simple sauerkraut and make a cup of tea by steeping the wasabi flowers. Posted on February 25, 2018 by Oregon Coast Wasabi. It is easier to grow wasabi than you might think! We recently sat down with Jennifer Bloeser talking about how to grow Wasabi Plant Starts here in the US. Jennifer Bloeser is the CEO and Co-founder (along with her husband Markus) of Oregon Coast Wasabi. Below is what we learned from Jennifer. People offer think that it is very difficult to grow wasabi. 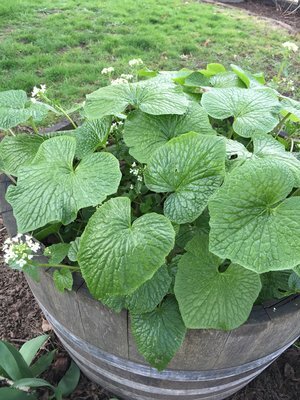 The truth is that there are only a couple of secrets to growing wasabi and after to speaking with Jennifer we now know those secrets and this article will share those secrets with you! Not only do Jennifer and Markus have the largest wasabi farm in the United States, they also grow wasabi in their very own yard in half wine barrels. If you are going to grow wasabi in your backyard you need to make sure that your wasabi plants have full shade. You can use the shade of another tree, the corner of your from porch, against your deck. Anywhere that you can get full shade. To be overly clear – if a wasabi plant gets sunlight it will wither and droop very quickly. Lettuce lets you know right away if it needs more water. Bottom line – keep the sail moist. Please note; while a wasabi plants native habitat in Japan is in a streambed, wasabi is not an aquatic plant and wasabi does not like to be in standing water. Bottom Line – well drained, wet soil but not standing water. One option that is very successful for growing wasabi is to plant your wasabi starts in 1 to 2 gallon pots with good potting soil. Doing this gives you flexibility for when the weather turns too cold or too hot. When that happen happens simply bring your wasabi plant indoors. So what is too hot or too cold? Glad you asked! See immediately below for that answer! What Parts of the United States Can You Grow Wasabi In? Wasabi can and does grow all over the United States! What you need to watch out for is weather that is too either too hot or too cold. If the weather gets over 80 degrees or under 32 degrees - simply bring your pots inside and keep them out of direct sunlight. If the weather is going to be over 80 degrees for just a few days and then go back to being under 80 degrees, you can leave the plants outside as they can handle warmer weather for a couple of days. Sadly, many of the wasabi seeds that are sold today (especially online) are not real wasabi i.e. Wasabia japonica, they are actually mustard seeds or seeds for “wasabi” mustard for arugula or seeds for “wasabi” arugula. Please note neither “wasabi” mustard or “wasabi” arugula is real wasabi. One is a variety of mustard and the other is a variety of arugula. There is a reason that the largest reputable US seed companies don’t sell wasabi seeds on their own websites. Wasabi seeds are very rare because they are very difficult to harvest. You are much better off simply getting wasabi plant starts and growing those. #1 The plant stalk i.e. the part that gets grated into wasabi paste. That part is knobby and green ands sticks up just above the dirt. This is often called the rhizome. #3 The leaf stalk, or stems if you prefer. 15 months to 2 years after you plant your wasabi start you can harvest the plant stalk (the rhizome). This is the part of the wasabi plant that is grated into wasabi paste. To harvest the plant stalk you pull the whole plant up and you will see some off-shoots / plant starts. Simply break those off. You can replant those and begin right away growing more wasabi! Take the plant stalk and only grate want you want to use right then. The rest you store in the refrigerator and when stored properly, it will keep for weeks. Keep your wasabi plant stalk in a plastic bag with a damp paper towel. 8 weeks after planting your wasabi start you can begin harvesting Wasabi greens i.e. the leaves. Wasabi greens are delicious and have many culinary uses! When you harvest wasabi greens make sure to leave the little leaf that is sprouting from the very top center of the plant. Wasabi plants grow leaves year round and you can keep harvesting leaves every 6 -8 weeks and enjoy wasabi greens during the whole 15 months to two years that you are growing the plant stalks. Wasabi greens can be eaten raw and you use them in cooking – they can be sautéed, juiced, or used raw in a salad! One of Oregon Coast Wasabi’s customers has made a spanakopita using wasabi greens instead of spinach! The same 8 weeks applies to the leaf stalk or stem. When you harvest wasabi green make sure to also harvest the leaf stalk. Wasabi leaf stalks are delicious! They are spicy and crunchy and you can eat them raw and use them in cooking. Think of them as thin spicy celery. Just like the Wasabi greens You can sauté Wasabi leaf stalks, steam them, juice them, or simply snip them with kitchen shears and put them into your mashed potatoes for wonderful wasabi mashed potatoes! If you want to grow wasabi in your back yard the best way to get started is to order wasabi plant starts. Those who order wasabi plant starts from the Wasabi Store receive a copy of The Oregon Coast Wasabi Guide to Growing Wasabi. Posted on February 16, 2018 by Jennifer Bloeser. This video shows the regrowth of the heart-shaped leaves and leaf stalks following the "harvest" or completely removing the leaves and stalks in early December 2017. Through the lowest light of winter, the leaves and stalks have regrown with vigor and are ready again for harvest. We are farmers and use the term "harvest" which translates to "eating". These leaves and stalks are ready for eating and the plants will be perfectly viable once again and ready for another tasty wasabi dish in another 6-8 weeks. The flower buds are a bit early this year. The flowers are small and white and can also be "harvested" In Japan, they are served as tempura (battered and fried) and also steeped into tea. We garnish mashed potatoes, salads, or add them to a spring pesto. Posted on February 16, 2018 by Oregon Coast Wasabi. 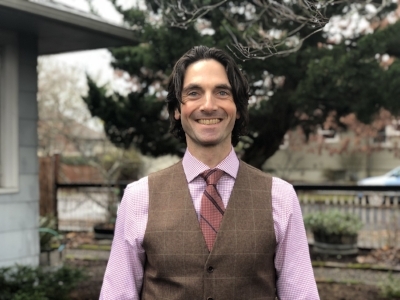 Episode 33 of the Modern Bar Cart Podcast features our very own Jennifer Bloeser — CEO and Co-Founder of Oregon Coast Wasabi! Posted on February 2, 2018 by Jennifer Bloeser. The weather forecast for wasabi planting on the west coast looks perfect. It may seem early, but if a deep freeze isn't likely, the earlier in the season the better. It will give time for the roots to establish during winter rains. The low light conditions will really get the leaf and stalk production accelerating. The more leaf canopy in the summer will keep the plants humid and retain moisture. The other bonus is that by the time the other vegetables are being planted, there will be wasabi leaves and stalks to harvest and eat. Posted on January 21, 2018 by Oregon Coast Wasabi. Garden plants in Portland Oregon on Jan. 5 2018. This video shows the heart-shaped leaves and stalks' new growth following harvest in December 2017. At the end, a juiced glass of wasabi heart-shaped leaves and stalks are sampled for heat and flavor. The greens (leaves) and leaf stalks (stems) were harvested from the garden in Dec. This video is an update to the Dec. 2017 video titled "How To Harvest Wasabi Greens (Leaves) and Leaf Stalks (Stems) From Your Garden". This video shows the harvested plants one month later. The plants are producing new growth even in the depth of winter and through several frosty nights. The video also samples the Dec. 2017-harvested heart-shaped leaves and stalks that were juiced and refrigerated. The juice is still hot, spicy and has a pleasant vegetal flavor and natural sweetness. Adding some apple, ginger and citrus would make a great healthy juice. The heart-shaped leaves could be a great substitute for spinach, kale, collard greens, cabbage, chard and other greens. The wasabi stalks can substitute for celery, green onion or herbs. It's a great spicy "celery stalk" in a bloody mary as well. Thank you for watching. We hope you enjoyed our video. Posted on January 6, 2018 by Oregon Coast Wasabi.